Traditional bioassays with biosensor bacteria are usually calibrated with analyte solutions of known concentrations that are analyzed along with the samples of interest (Chakraborty et al., 2008; Hansen and Sorensen, 2000). This is done as bioreporter output (fluorescence or colour) does not only depend on the target concentration, but also on the incubation time and physiological activity of the cells in the assay. Comparing the biosensor output with standardized colour tables in the field application seems rather difficult and error-prone. To solve this hard truth, a new approach called ‘traffic light’ heavy metal bioassay was then developed. Previous work has shown that the “traffic light” bioassay could work independently of external calibration of the bioreporter output, thus to control assay variations and to improve application ease(Anke Wackwitz, 2008). Actually, an internal calibration based on the use of multiple isogenic bioreporter cell lines with the same output but drastically different sensitivity at a given heavy metal concentration is proceeded during this bioassy. Specially speaking, we pyramided the information collected during the Promoter Characterization, Operation Characterization and Modeling. 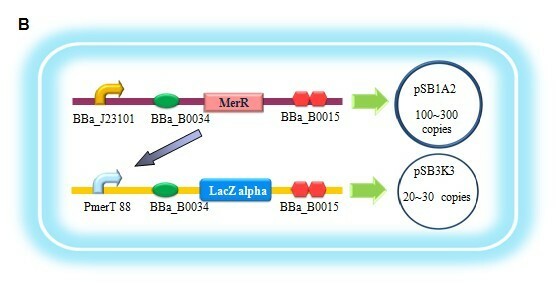 It has been shown that the expression level of MerR and the binding affinity of MerR to the cognate promoter dyad sequence both significantly determinate the bacterial sensitivity to mercury — higher MerR expression intensity and lower binding affinity of MerR to DNA target would result in a less sensitive bacterial mercury sensor and vice versa. In order to verify this, we constructed a reporter system similar to the ones we used before, as shown in Fig 2C. (to read more…). Fig 2. Result of pyramiding. According to the information collected in promoter characterization and operation characterization, both the expression level of MerR and the semiconserved region of MerR binding site could determine the threshold of mercury sensitivity. (A) Each combination was carefully characterized. All of the dose response curves represented as a hill function. 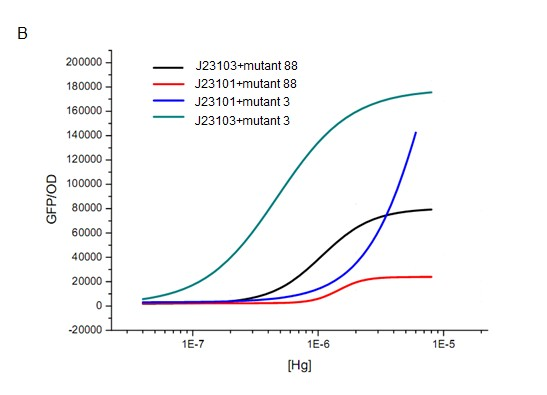 (B) When comparing these combinations, we can easily find that both of the factors worked as expected: for instance, BBa_J23101+Mutant 3 represents a higher threshold than that of BBa_J23101+Mutant 88 and BBa_J23103+Mutant 88 has a higher threshold than BBa_J23101+Mutant 88. (C) The genetic construction of the system used for characterization. Table 2 The parameters of Hill function fitting. 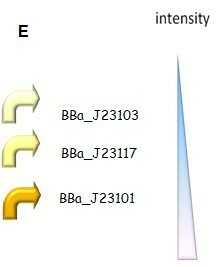 Therefore, 4 isogenic biosensor strains with the same reporter output (beta-galactosidase) but differing in the mercury concentration threshold at which their reporter circuit is activated was constructed as is shown in Fig 3. Interestingly, when we employed full length LacZ gene (BBa_I732017) as the reporter gene for design in Fig 3, a significant leakage expression emerged which was as high as we could not tell the difference in intensity of the beta-galactosidase activity between experimental group and the control. However, when using LacZ alpha fragment instead, we found that the leakage expression became negligible – Hg (II) induction would significantly activate the beta-galactosidase activity compared with the control and bacteria bearing the mercury sensing device behaved in a dose-response manner in response to mercury concentration gradient (Fig 4), which implied that when separated into 2 peptide fragments, the enzymatic activity of LacZ (beta-galactosidase) decreased remarkably and the decrement could be rescued by higher expression level of the alpha fragment. It was probably because the alpha-complementary process is mediated by intra-molecular non-covalent interactions. In comparison with the full length LacZ, alpha-complement forms the correct conformation for beta-galactosidase activity in lower possibility. Therefore, mercury sensing device exploiting full length LacZ as reporter gene can not actually sense the mercury. However, it may act as the positive control in the traffic light assay, which exhibits beta-galactosidase activity whether mercury is in presence or not (Fig 3). Fig 3. 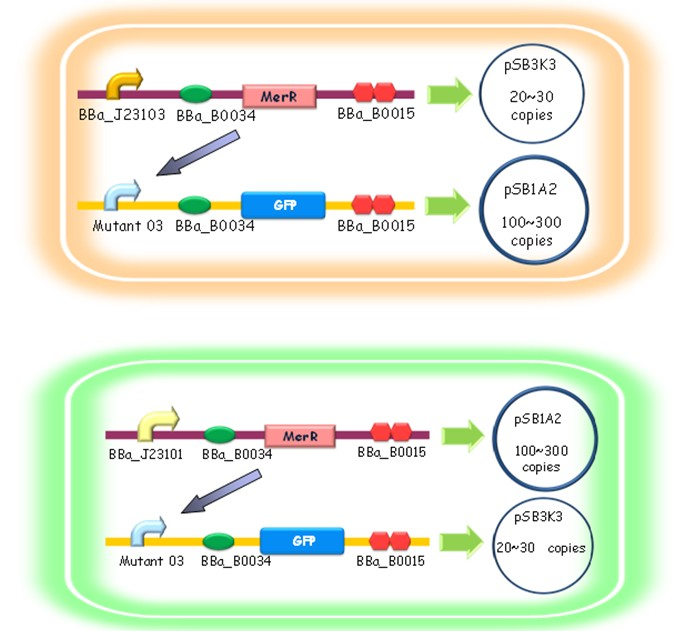 Scheme of construction of 4 isogenic biosensor strains. It was a pyramiding process during which the phenotypes of bacterial reporter developed previously in our project were combined, in order to implement strains with different mercury sensitivity. 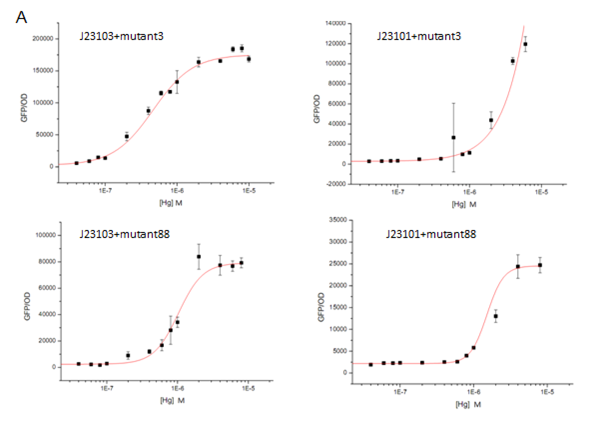 (E) BBa_J23103, BBa_J23101 and BBa_J23117 belong to a constitutive promoter library from partsregistry, among which BBa_J23103 is a very weak one, BBa_J23117 is medium and BBa_J23101 is the second strongest in the library. (A)Expression of MerR driven by weak constitutive promoter BBa_J23103 on low copy number plasmid backbone pSB3K3 was pyramided with wild type PmerT which is the most mercury-sensitive promoter combined with LacZ alpha fragment as the reporter gene on plasmid backbone pSB1A3. It is an extreme to confer the bioreporter the most sensitivity, based on our previous results. 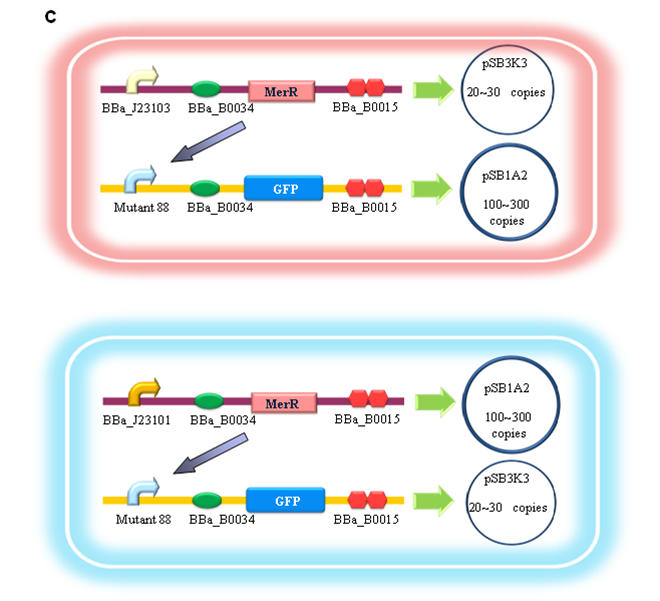 (B) Strong promoter BBa_J23101 drive the high expression intensity of MerR on plasmid backbone pSB1A2, while PmerT 88 on pSB3K3 is the most insensitive mercury-response promoter developed before. Reporter gene is still lacZ alpha fragment. This is the other extreme of MerR expression intensity, aiming to endow the bacteria the most insensitivity. 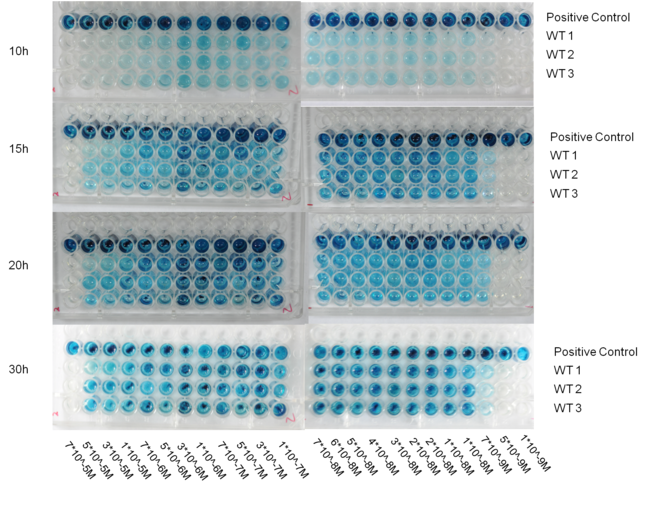 (C) Promoter BBa_J23117 is medium compared with other 2 constitutive promoters, and the same with PmerT 03 which was screened out previously. This mercury sensing device is expected to be more sensitive than (A) and less than (B). (D) This device is similar to (A), except the reporter gene was replaced by LacZ full length gene. As mentioned in the context, when acting as the reporter gene, full length LacZ represents a significantly leakage expression, giving output regardless of the input, of which we took the advantage to regard it as the positive control in traffic light bioassay. Further work to obtain results demonstrating that the bioreporter system using combinations of these biosensor strains to define mercury concentration ranges is still under progressing. However, as data obtained in Fig 4, the strain exploited in the proof of concept has already been sufficient to discriminate mercury concentration range that fits very well with the current permissive (e.g. 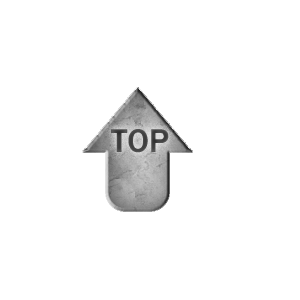 World Health Organization) levels of mercury in common aquatic environment, such as drinking water (10^-8M) . When heavy metal emerges, a tri-node response will be switched on in our biosensor (Fig 5). Different strains with parameter variations between the nodes will have different response threshold to heavy metal ions, such as mercury, according to the result of our modeling. Fig 5. Structure of Tri-node response system. According to the results of modeling, we designed the specific genetic circuit to realize the linear response function. Node A is a generator of MerR. For Node B, the gene is the activator which can activate the psid promoter. Node C is GFP whose expression was driven by Psid (activated by activator) and PmerT (activated by MerR). To get a linear response curve of bioreporter in a wide concentration range, we constructed parameter spectrums. The first one was X1, which represents the concentration of MerR. 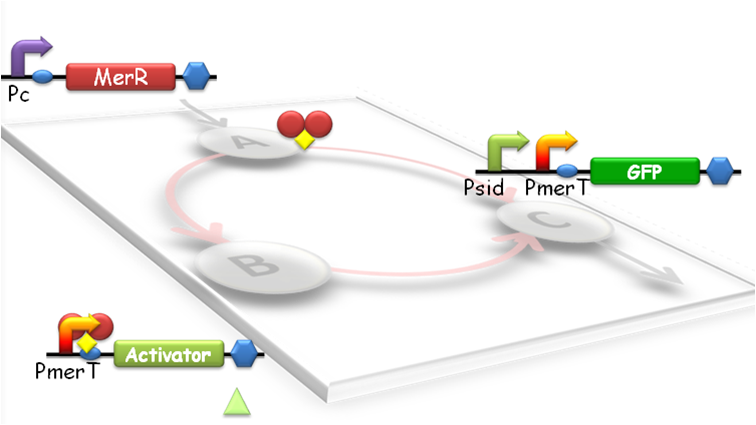 We constructed the spectrum by prefixing different constitutive promoter to MerR. The second was to change K13 which denotes the affinity between MerR and the PmerT promoter. 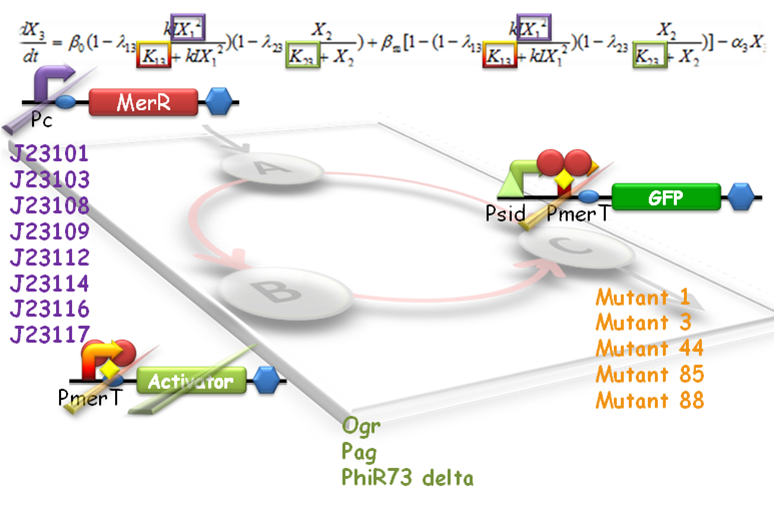 We exploited random mutagenesis to construct a libarary of PmerT with different MerR binding sequences. Fig 6. Spectrum construction of parameters which are critical to the robustness of our genetic circuit design predicted by our modeling. Fig 7. Our bioreporter with tri-node response system will possess a linear transfer function (right) rather than the natural hill function (left). Just before wiki freezing, data of the final result (linear transfer function transformed from hill function) was obtained by us! Since the transfer function of bioreporter response represents linear, the working range of the bioreporter have expanded, and the error rating will be reduced (Fig 8). This type of bioreporter will be excellent for in lab accurate measurement or heavy metal pollution assessment! Fig 8. The transforming of dose response curve by carefully designed genetic circuit.